Dickie's Primrose is a perennial herb found in NE India. Leaf stalks are winged, about 1/5 to as long as leaf blade. Leaves are elliptic-obovate to oblanceolate, 1.5-7 cm long, 0.3-1 cm broad, tapering at base, margin nearly entire to remotely toothed. Flowering stem is 8-20 cm tall. Yellow flowers are borne in 1-6-flowered umbels. Flower-stalks are 1-7 mm, elongating to 2.5 cm in fruit. Sepal cup is tubular-bellshaped, 6.5-8 mm, parted to 1/3 or near middle. Sepals are triangular. Flowers can be yellow, white, or purple. Flower-tube is 3-4 times as long as the sepal cup, velvety at mouth and inside. Flowers are 2-3 cm wide with inverted- heartshaped petals 7-8 mm. Capsule is ovoid, nearly as long as calyx. 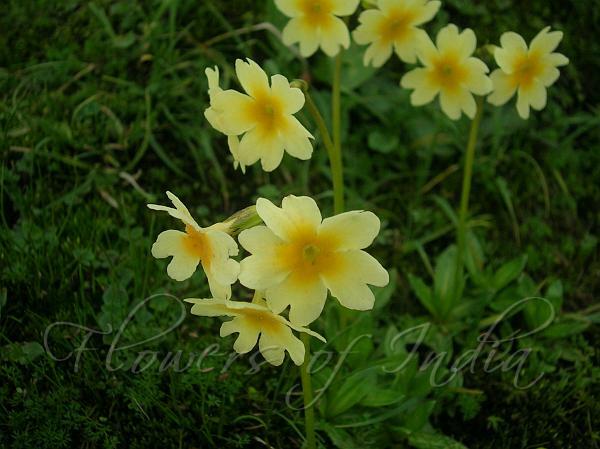 Dickie's Primrose is found in wet meadows in the Himalayas, at elevations of 4000-5000 m in Bhutan, Myanmar, NE India, Nepal and Sikkim. Flowering: June-July.